Scientists around the world have crossed a threshold into a promising and challenging new era in the quest for fusion energy. So says physicist George “Hutch” Neilson, director of advanced projects at the U.S. Department of Energy’s Princeton Plasma Physics Laboratory, in remarks prepared for the 2013 annual meeting of the American Association for the Advancement of Science in Boston. The new phase has begun with the construction of ITER, a fusion facility of unprecedented size and power that the European Union, the United States and five other countries are building in France. Plans call for ITER to produce 500 million watts of fusion power for some 300 second during the 2020s. 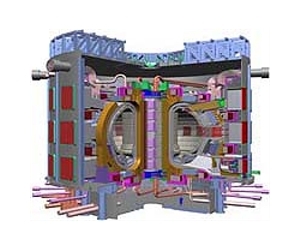 With construction of ITER under way, many national fusion programs “are embarking on their own projects to demonstrate the production of electricity from fusion energy,” Neilson said. Read more: Previewing the next steps on the path to a magnetic fusion power plant — Space Daily.